How long has it been since you made sushi? Myself, I can't remember when. I used to roll sushi occasionally with friend Laci, fun times that were as much about socializing as they were about dining. 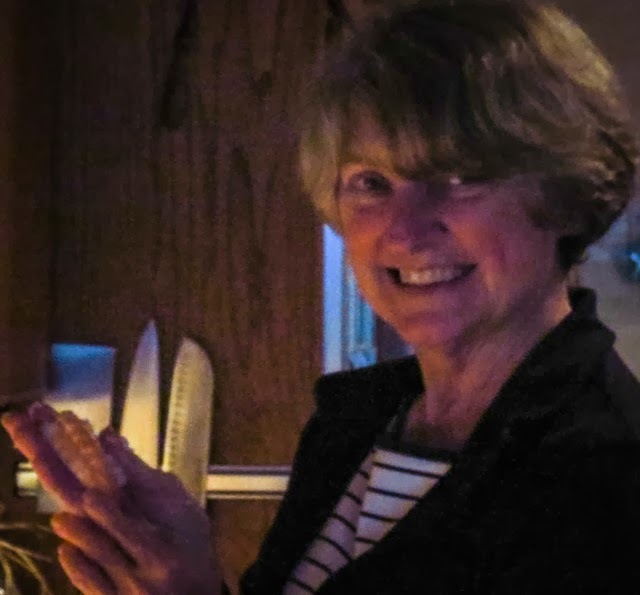 RL was enthusiastic about sushi when we had it for dinner, but it's been a while, a long while, since we've enjoyed it at home. For no particular reason sushi has just dropped off the kitchen rotation. It was time to get back in practice. 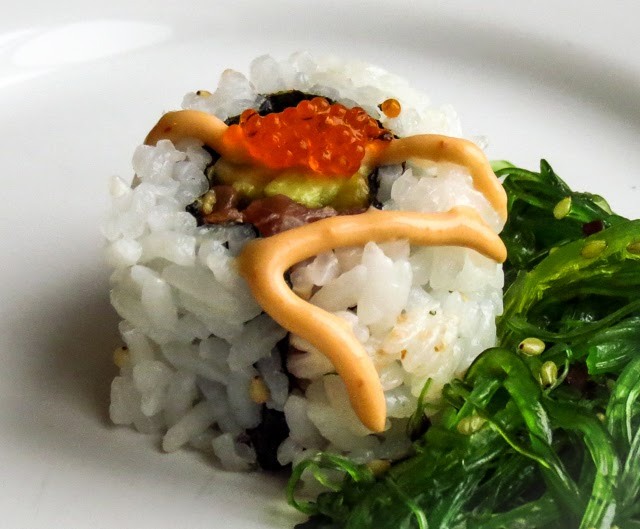 The week's dreary winter weather made it a perfect time to hang out in the kitchen and revisit Sushi 101. Hilary came by to join in the fun. 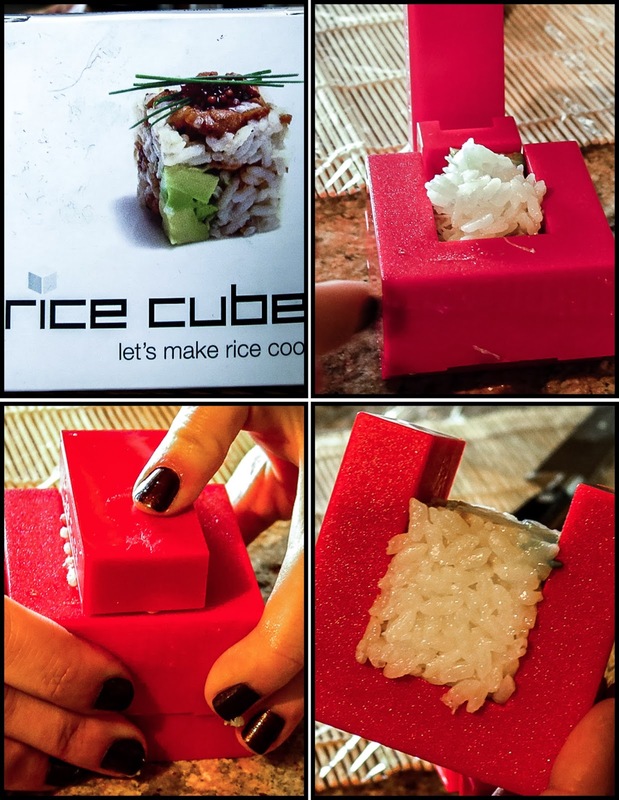 People fret about learning the techniques for rolling sushi, but the important activity really begins with the seasoned rice. There is no good sushi without good sushi rice. Really. 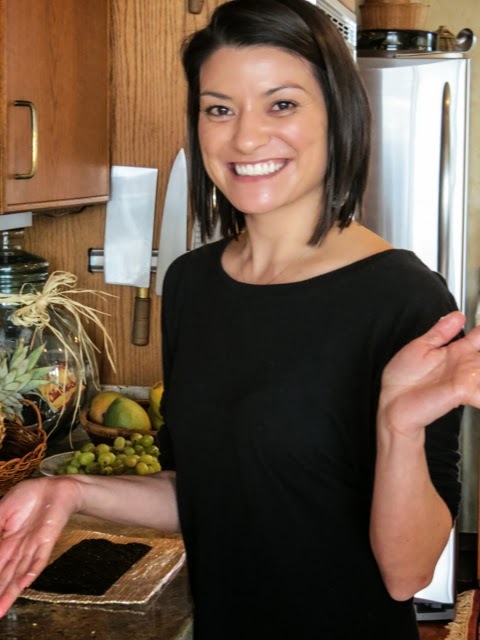 It's not difficult to prepare, but here are some rice cooking tips to follow. 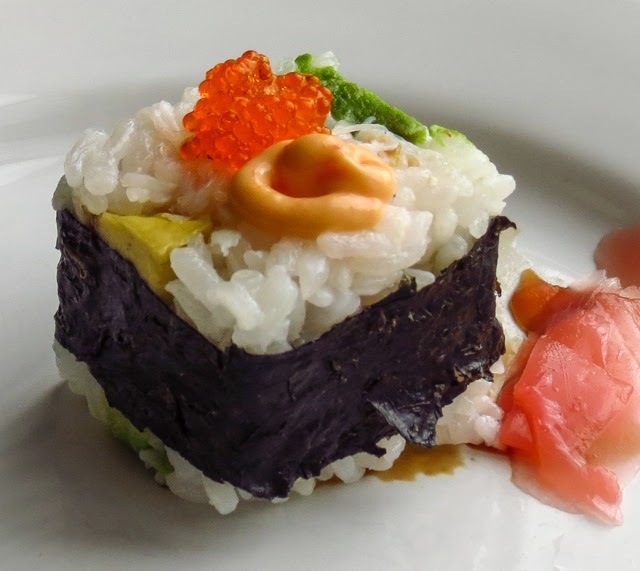 Use medium-grain Calrose or sushi rice, NOT short-grain glutinous or sticky rice. Rinse the rice well to remove the dusty starch coating on each grain, rubbing gently with your hands. Drain. Repeat rinsing and draining 4 or 5 times until the water runs fairly clear. Drain well (and some cooks suggest you let the rice sit draining in a strainer for 14+ minutes). Use a rice cooker for consistently good rice. Add the rice and a roughly equivalent amount of water to the cooker. 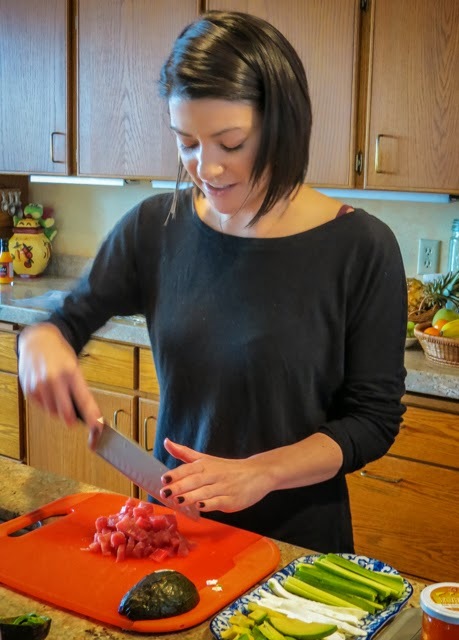 (OR use the knuckle approach: use your index finger to touch the TOP of the rice and add water until it reaches the knuckle.) Turn the machine ON. When the rice cooker switches from COOK to WARM, it's time to transfer the rice to a wooden or other non-metallic bowl or tray. 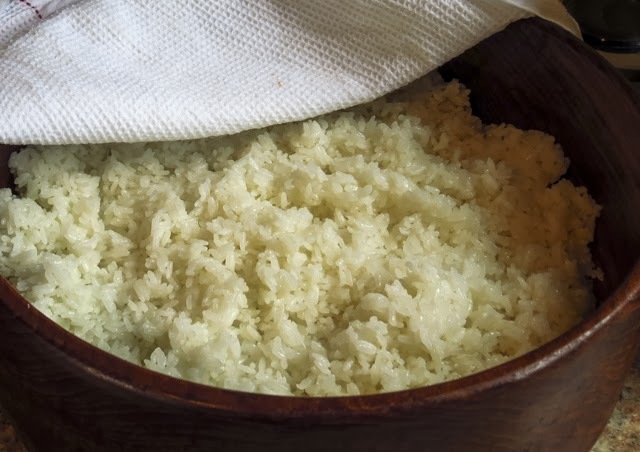 Sprinkle the seasoned rice vinegar* on top of the rice; use a wooden paddle to slice the mass of rice diagonally in several places and turn it over, all the while fanning to help it to cool and achieve a somewhat glossy surface. Continue cutting, folding and fanning until cooled to room temperature. Cover the cooked rice with a damp tea towel or plastic wrap until you are ready to use it. Do NOT store it in the fridge as that will change the texture, and not in a good way. It's also important to prepare and organize the filling ingredients ahead of time. 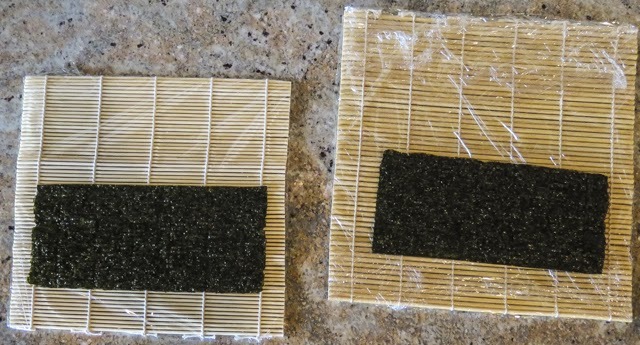 Have plastic wrap handy to enclose the bamboo rolling mats and to wrap each sushi roll as you go. Here's a quick overview of our efforts this week. Inside/Out California Rolls (uramaki) with Dungeness crab, sesame seeds, cream cheese batons, cucumber strips and sliced avocado. The first roll might not have been perfectly formed, but it tasted just fine. 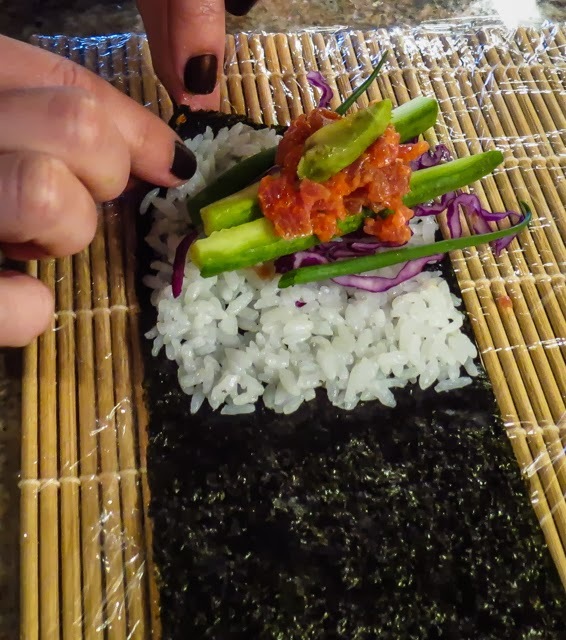 Rice Cubes, using a clever Australian-designed gadget, with assorted fillings and topped with Sriracha sauce and tobiko (flying fish roe). This was a fast, fun way to turn out single bites. 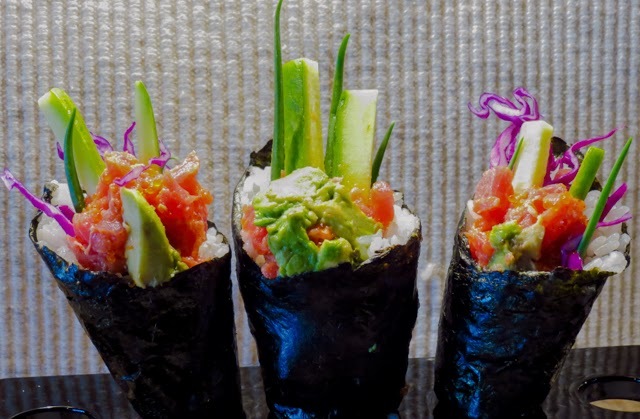 Spicy Tuna Hand Rolls (temaki) with rainbow-colored crunchy vegetables. They were gorgeous, but a bit challenging to eat. Inside/Out Spicy Tuna Rolls (uramaki) with mango, mint, avocado, Sriracha sauce and tobiko. These were awesome, our very favorite taste treat of the afternoon. The fresh mango and mint enhanced the flavor of the Sriracha-flavored diced ahi tuna for an amazing sweet/hot/tangy/smooth/crunchy combination. 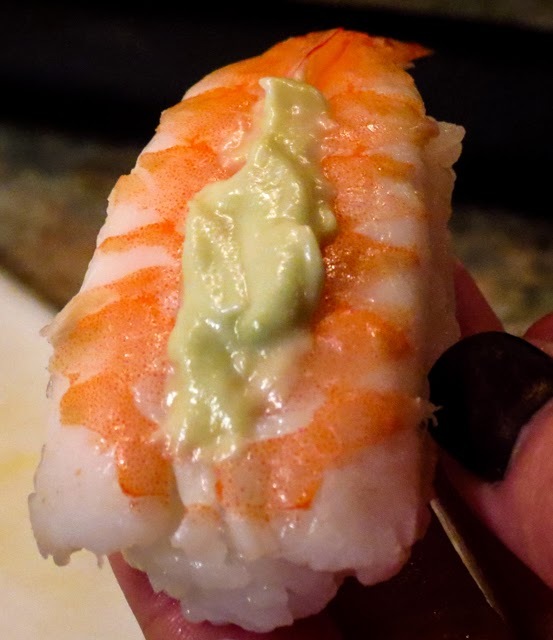 Just when we thought we couldn't sample one more bite, we formed Nigiri-style sushi, a hand-formed pillow of rice topped with a butterflied shrimp and a wasabi-flavored sauce... yum! We made room for several of these beauties.